It is my sincere honor to greet the Honorable Fumiko Saiga, Consul General of Japan, Seattle; Rikio Minamiyama, Consul; John Powers, Spokane Mayor; Gary Livingston, Superintendent, Spokane School District 81; and Yvonne Morton and Ann Price from the Northwest Museum of Arts and Culture, formally Cheney Cowles Museum. I am especially pleased to welcome our guests from Massachusetts, Melinda Willis and Pat Kenneally; from Tennessee, Mary Smith; a group from Seattle, Hiromi Pingry, Anna Maria Malkoc, a former faculty member, her daughter Eden Malkoc, and grandson Gordon Loop; and last but not least, Mr. Shosuke Genga, renowned master doll artist, and his daughter, Yoko Kawamura, from Osaka, Japan. Welcome to all these distinguished guests and everyone. My special thanks to Mr. Haralam and his students for telling the Friendship Doll story in such a wonderful way. Hina Matsuri has more than 1,000 years of history giving the message for young girls’ happiness. Originating as a family tradition, Hina dolls are displayed in homes and handed down from mother to daughter for generations. These days, Hina doll sets are also displayed at schools, hotels, department stores, and everywhere in Japan during the month of March. Girls often put their favorite dolls on tiers at home to share the joy. Even now, some 1927 American Friendship dolls are displayed with Hina Dolls sets in some elementary schools in Japan. The symbol of Hina Matsuri is peach flowers. Hina dolls are reminders of family history: of grandma, grandpa, mother’s cooking, happy childhood, and friends. Additionally, March is the time of change in Japan. Graduations are held in March, and a new school year begins in April. Springtime is the season, and hina dolls send feelings of new beginnings and growth. Now let me introduce you to Miss Tokushima, a very quiet smiling lady. She was born in Tokyo in 1927. She is 74 years old. She looks so young for her age. Miss Tokushima and her 57 sister dolls are top class artistic dolls who came to the US as dolls of friendship. Miss Tokushima and all the Friendship dolls in both countries are witnesses to the long history of US-Japan relations. It was early in 1992 when I first saw her at then Cheney Cowles. I was overwhelmed by her innocent smile and clear beauty. Immediately, I decided to celebrate the Doll Festival with her in Spokane. We were motivated first to show our appreciation to the people of Spokane for their long protection of the doll, and secondly, we wanted to share the history and story of friendship between the U.S. and Japan. 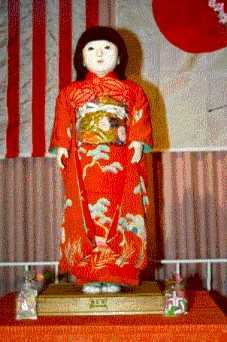 We celebrated the first Doll Festival on March 3, 1992 at Cheney Cowles Museum. Since then, she has been attending the celebration every year and has a special impact on us. We appreciate the generosity of the Northwest Museum of Arts and Culture, formerly Cheney Cowles, to show Miss Tokushima to the public. Dr. Sidney Gulick, 3d, grandson of the initiator, and his wife Frances, continue the noble vision of Dr. Gulick. Both doctors of mathematics at the University of Maryland, the Gulicks have sent over 100 American dolls with hand-made clothes to Japan. They remain very active in promoting friendship and international relations, as did their grandfather. We at Mukogawa were impressed as well. Our mother institution in Japan started fundraising to send new ambassador dolls to American children, and the first Japanese dolls were presented to 53 recipients on March 3, 1993. Every fall in Japan, citizens give money to buy dolls, or donate from their personal collection, or make hand-made dolls for our program. Several of the dolls you see today are gifts from students here today! Thank you Mukogawa students. "Boku no mae ni michi wa nai. Boku no ushiro ni michi wa dekiru." "In front of me there is no road. Behind me I leave a road." I think everyone can be a pioneer and build a unique road for others to follow. Even in solitude, if you continue building a new road, you will find somebody working along with you in silence. One person makes a difference. Dr. Gulick opened this fantastic path for us. I would like to broaden this path for peace and friendship in the world with you, my friends.